Two things struck me almost simultaneously the first time I looked at this picture. The first one was: YELLOW! And the second was that the painting looks like an old-fashioned epic movie poster that melds key moments of the story together with no regard for scale and time-line. The yellow is such a happy colour, bursting with energy, life and light. It is not a colour traditionally chosen by artists to portray a Pieta, a Descent from the Cross or a Deposition. And that is what this is. It's a painting of Jesus dead. The cross looks like a very tall telephone pole. See how the little windows in the building behind it can be read as those ceramic spindles that bear the telephone wires? There's good news a-coming! The wires will soon be buzzing! The workmen at the top of the cross are certainly not dressed in the garb of first-century Palestine, and the bearded guy just behind the horse's head is wearing jeans and a sweatshirt with his Middle Eastern headgear. Others in this picture are dressed just like the people in the children's Bible from my childhood, but there's one large long-haired swashbuckling figure, at the left, who could belong to Rembrandt’s seventeenth century. When and where is all this action taking place? From a portal leading into a magic city a white horse gallops towards us. The portal's pediment is inscribed: 2010 – Jesus Lives. Another horse patiently waits to receive Jesus’ dead body. Now and then. Will we stand still, awaiting the touch of the risen Jesus and be healed? Are we ready to bear the burden he chooses for us? This is a very busy painting. It's anything but still. Diagonals shoot off or zigzag in every direction. It's spatially confusing with some of the figures further away shown bigger instead of smaller. The top of the cross with its tiny figures looks very far away, yet its base is planted right here, directly in front of us. And it's that cross, the strong vertical line down the middle between earth and heaven, between man and God, which holds all together. The cross is God's anchor between past, present and future, between being lost and being found. The cross was his plan. It is his plan. Then and now. Here and there. Erna Buber-deVilliers is a retired Art teacher, a wannabe-writer, and a dabbler in many things. Get to know her at her website or friend her on Facebook. 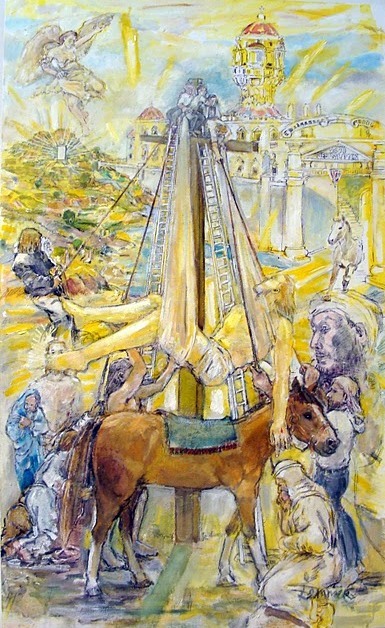 Deon Lemmer: Resurrection of the Beloved (a yearly event), 1260 x 750mm, acrylic and oil on stretched canvas, 2010. More of the artist’s work can be seen here and, should you wish to make contact with him, you may get hold of him on Facebook. You may watch a short video (3 min 37 sec) and see Deon Lemmer explain some ideas and imagery behind his paintings that were on show at the EPSAC Gallery in Port Elizabeth in January 2010.